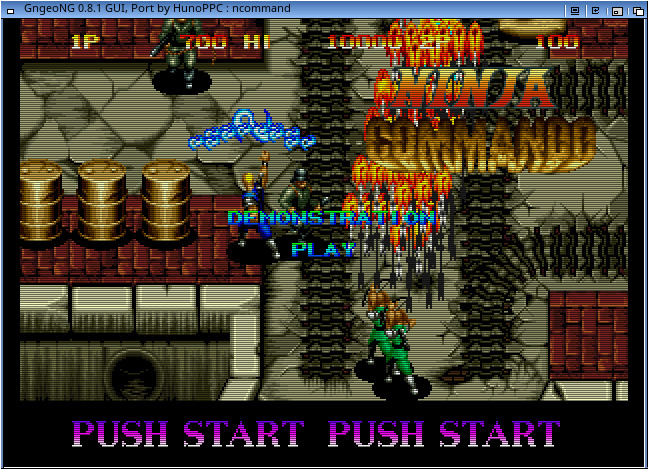 Description: A fast and powerful command line Neo Geo emulator. GnGeoNG is a fast and powerful command line Neo Geo emulator for GNU/Linux, FreeBSD, and maybe some other Unices. The 68k core from the generator project by James Ponder. Starscream 680x0 emulation library by Neill Corlett. Cyclone 680x0 core by fDave, Reesy & Notaz. Raze Z80 emulator by Richard Mitton. Z80 Mame core from the Mame project. DrZ80 core from Reesy & Flubba. YM2610 Mame core by Tatsuyuki Satoh. (ie: mslug.rc) that go to PROGDIR:romrc.d/ by default.
. Fix a bug with error handling when a bios file isn't present. .Add PAUSE with KEY "p"
> one for a cool Ami603 GUI "NeoGUI" is named "gngeo"
> one with a new GUI incorporate on GngeoNG created by Peponas, is named "GngeoNG-GUI"
- Add PAUSE with KEY "p"
- Increase speed on the GUI for loading and using a menu (60% fastest). - Vsync has deleted now (problems with doublebuffer on AOS4). - Fix crash on loading savestate function (Z80 error), force libération of 68K emulation. - Now support a samplerate 44100, added on a menu. - New fix for SAVE STATE (please delete your old Save state on "data" folder, not compatible with this new engine. - Fix save config file "gngeorc" on folder "conf", now writing correctly your saved prefs. - Fix and write a new code -> prefs config for individual game and add new PATH on prefs (confpath:), new global prefs for individual game "gngeogamerc". -Full support render software, no support opengl render. 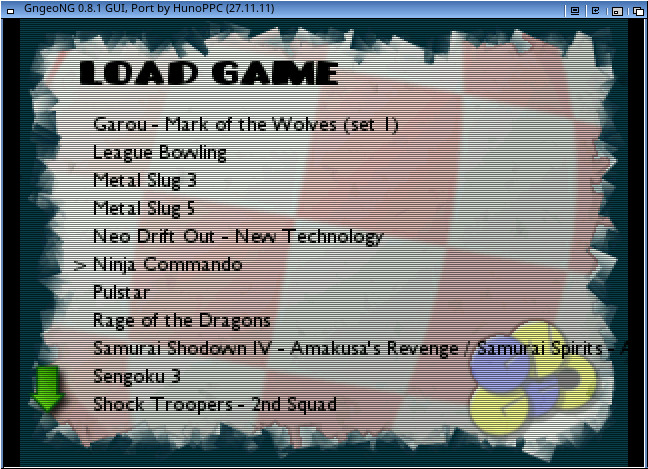 - Copy the folder Gngeo in your Emulation section, start the executable in the shell with your command, use version with native GUI , or use NeoGUI 51.4 (minimum) on http://os4depot.net/. (important delete your OLD prefs for NeoGUI and reboot your "miga" please). IMPORTANT: YUV, OpenGL and OpenGL2X don't support effect's (very slow) use effects with soft blitter please. Options "save state" and "load state" are experimental that can crash the machine. Enable auto frameskipping. The program will determine the best frameskip value to avoid lagging the gameplay on a machine that is too slow to emulate at full speed. Use the specified blitter. -b help will provide a list of available blitters. soft, opengl, and yuv are typical choices. Enable gngeo's internal debugger, for hacking, cheating, or fixing bugs. Use the specified video effect. -e help will provide a list of available effects. Start gngeo in fullscreen mode. Use a SDL hardware surface for the emulator's video. This can improve performance if your video hardware/drivers are fast. Enable interpolation from one frame to the next. This can make the display look "smoother", but has a performance penalty. Use PAL timings. This currently has bugs. When the emulator is started, show a frames-per-second count. This can be used to gauge a baseline performance for the emulation. 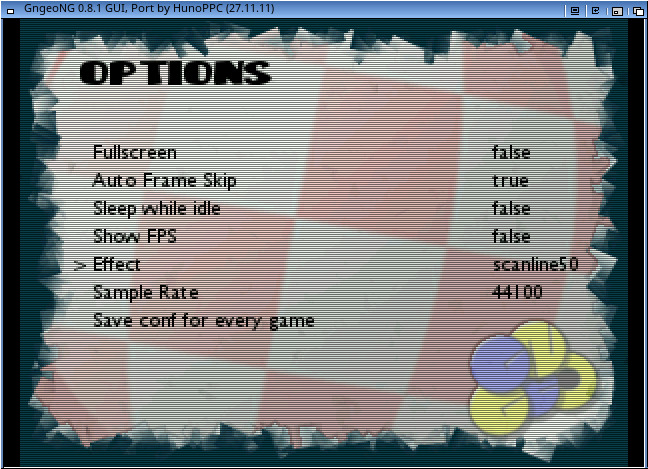 Enabling this option will cause the emulator to give up time to the system when it is idle. It can incur a performance penalty, but can also make the emulator "nicer" to the rest of the system. 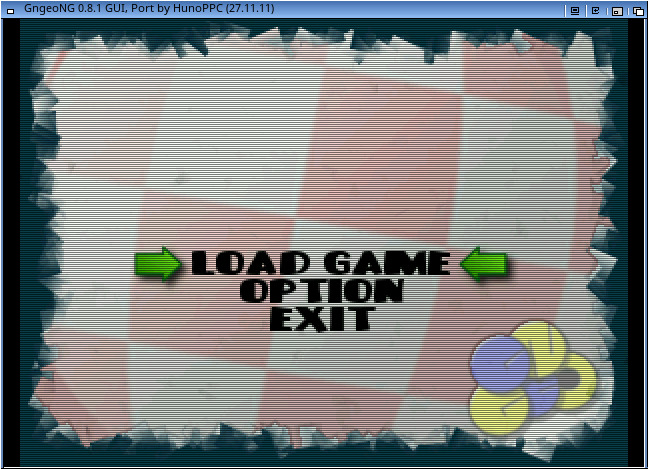 This option allows you to set the type of the emulated system to home or arcade, depending on how you prefer to play your games. There are some differences in many games if they detect a home system instead of an arcade system. MODE=848x480@60. You may encounter a mode which is not hardware accelerated when using this option. Set the sound sample rate to N. N will typically be 11025, 22050 or 26000. F2 => Save screenshots on DIR "/PROGDIR/shots"
Ami603 For the GUI "NeoGUI"